This week is Spring Break for Wendy and the kids. We try to take the girls to a museum or something for a day trip when we have breaks like this. We’ve gone to the Strong Museum in Rochester, the Buffalo Museum of Science, and some other local attractions. This time, we made plans to go a little bit farther than normal. We were going to take the girls to the Women's Rights National Historic Park in Seneca Falls. It’s only about two hours out to Seneca Falls (unless you ride with four girls who have to stop for the bathroom), so it’s an easy day trip. The original plan was to go to the site where the first Women’s Rights Convention was held July 1848. 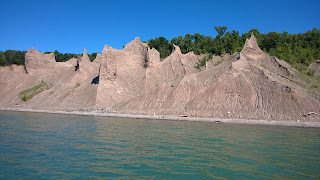 Then we were going to go up to Wolcott to Chimney Bluffs State Park. When we first thought of going to Seneca Falls a couple months ago. We’d go at some point. Being the parents of four daughters, women’s rights are at the front of our thoughts. We want to make sure that they understand they can be strong, successful women. What better place to continue the lessons we have been giving at home? Unfortunately, due to budget issues in Washington, the hours at the Women’s Rights National Historic Park, and at all national parks across the country, have been severely slashed. Not to jump on my soapbox here, but I have a bit of an issue with Washington continuing to collect a full check while promoting their own agendas instead of the best interests of their constituents. As a result, they close down our cultural centers. Anyway, we had to make a slight change of plans. We decided that we would go to the National Women’s Hall of Fame, which is also in Seneca Falls. The building is a nondescript, gray building, snuggled tightly between a restaurant and a yarn store. The building was rather small, but they are working on a massive capital project to move to a much larger facility. With the new building, they will be able to display more artifacts than they can now. In a narrow pair of rooms, the museum is wall-to-wall plaques of all the women who have been inducted into the Hall of Fame. It was very interesting, but overall, not very conducive to pre-teen girls. To their credit, they were extremely well behaved, and moved about the rooms reading many of the plaques. The three older girls each had some women who they were looking for. Of course, we had to find Belva Lockwood among all the inductees. Corliss found Rosa Parks, but wanted to know if Claudette Colvin was inducted. She learned in class about Colvin for refusing to give up her seat on a Montgomery, Alabama nine months before Rosa Parks. Interestingly, Colvin is not inducted yet. Since the nominations come from outside the Hall of Fame, Corliss could send in a nomination for her. The attendant on duty was extraordinary with assisting us with any questions be had. 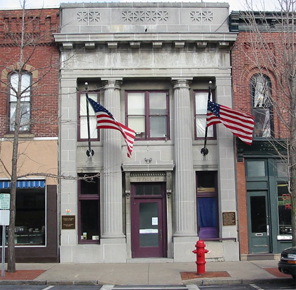 Almost directly across the street from the Hall of Fame is the Seneca Falls Visitors Center and Museum. In three stories, they had a floor about the general history of the town, a floor on industry, and a hands-on section for the kids, which featured inclined planes, waterwheels, pumps, and pulleys. The kids loved it. We all learned a lot there. 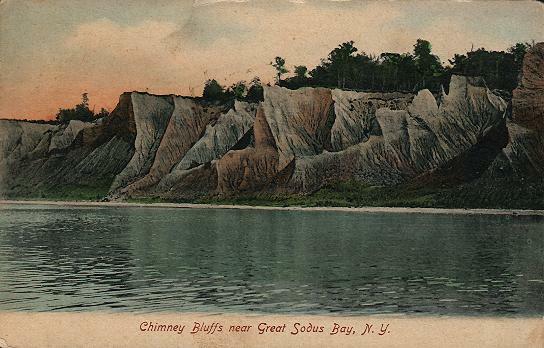 Once we exhausted our Seneca Falls museums, we decided to head up to Lake Ontario to check out the Chimney Bluffs along the lake. Thanks to glaciers from the last Ice Age, drumlins have been left behind. They are large mounds of land made up of clay, sand, and gravel where erosion took place under the ice. Once the ice sheets receded, these landforms were left behind. The Chimney Bluffs are the remnants of a drumlin being eroded away by the waves and storms of Lake Ontario. They are absolutely breathtaking. While we were there, we actually saw some of the banks collapse down to the lakeshore. The State Park is mostly unmanned. You have to pay for parking through a machine. There are four miles of hiking trails. We tried to walk along the Bluff Trail. Since we’ve had such a wet spring so far, much of the trail was very muddy. As a result of that same wetness, along with that strong windstorm earlier this spring, there has been a lot of erosion along that trail. There were some places where the trail hugged right along the cliffside and was hanging over empty space. A lot of trees were down. At one point, the trail simply disappeared. Enough of the lake had washed away the land that there was no passing the gaping maw. We had to turn around and go back. We found that we could drive to the other end of the park, right where the Chimney Bluffs were. The area is very dangerous as the land along the rim can give way at any time. Hikers need to stay away from the edge. Still, those bluffs are beautiful. I would love to get out in a boat and see them from the water. We spent the day not too far from home and saw things we’ve never seen before. We didn’t need to travel thousands of miles to see manufactured entertainment. We saw the best of human nature and the best of Mother Nature. We did it as a family, and we all enjoyed ourselves. The girls played games in the truck while we drove and they got to learn a little something the fun way. Craig Bacon is still a brown sign tourist. He hopes that the historic parks quickly return to their normal hours. There are so many parks and so little time. Lets not waste that time on frivolity.